Can playing the piano actually make you smarter?!? The book, The Talent Code: Greatness Isn't Born. It's Grown. Here's How. exemplifies how some kids make tremendous performance progress when they have had piano lessons and while others do not according to a 1997 study. A wide range of variables were considered in this study: IQ, aural sensitivity, math skills, rhythm, sensorimotor skills, and family income level. How long do you think you will play your new instrument? 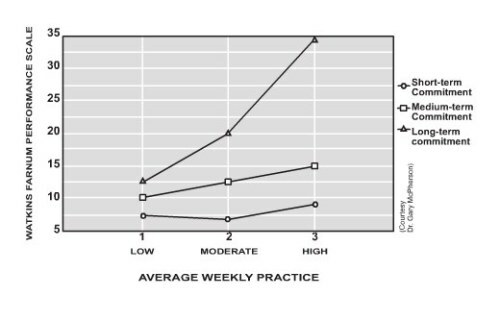 The graph depicts how the long-term commitment of piano lessons AND a high level of weekly practice significantly increase a persons performance. "I couldn’t believe my eyes. Progress was not determined by any measurable aptitude or trait, but by a tiny powerful idea the child had before even starting lessons. The differences were staggering. With the same amount of practice the long-term-commitment group outperformed the short-term-commitment group by 400%. The long-term-commitment group with, with a mere 20 minutes of weekly practice, progressed faster than the short-termers who practiced for an hour and a half. When long-term-commitment combined with high levels of practice, skills skyrocketed." Parents: Everyone has unavoidable "down" periods. Please continue to encourage your child at the piano and I will do the same!